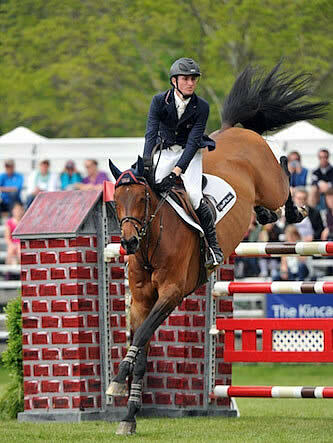 McLain Ward and HH Cannavaro. Photos copyright The Book LLC. 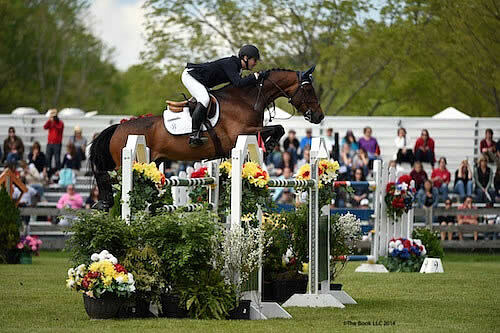 North Salem, NY – May 18, 2014 – The Old Salem Farm Spring Horse Shows came to a successful conclusion with their highlight event, the $100,000 Empire State Grand Prix, presented by The Kincade Group, Merrill Lynch. McLain Ward rode to first and second place with HH Cannavaro and HH Carlos Z, both owned by Double H Farm, over a prestigious field of horses and riders. After two weeks of top finishes, Darragh Kenny won the $20,000 Leading Jumper Rider Award, presented by Houlihan Lawrence. Today’s competition concluded two great weeks of equestrian sport in North Salem, and Old Salem Farm would like to thank the exhibitors, sponsors, and staff for their support. Watch an interview with grand prix winner McLain Ward! The Old Salem Farm Spring Horse Shows were held May 6-11 and May 13-18 at Old Salem Farm in North Salem, NY. The shows featured over 130 hunter and jumper classes each week, bringing together top competitors, including Olympic show jumpers, from across the country to compete for almost $500,000 in prize money. There were 42 entries in the grand prix, and nine of them were clear to advance to the jump-off over a course designed by Ireland’s Alan Wade. The first clear round in the jump-off came from Leslie Howard on Jane Clark’s Wintu, who recorded a time of 38.758 seconds. They would finish in fourth place. Next in, Candice King and Bellissimo LLC’s Kismet 50 placed fifth with a time of 40.325 seconds and no faults. Ward and HH Cannavaro set the winning time at 36.896 seconds. The rider who came the closest to catching Ward was Michael Hughes of Allendale, NJ, on Macarthur, who stopped the timers in 37.836 seconds for third place. Ward and his second horse, HH Carlos Z, had a time of 37.232 seconds, just off the pace. Earlier in the day, Lillie Keenan rode Abigail Wexner’s Vanilla to victory in the $7,500 Medium Junior/Amateur-Owner Jumper Classic with a clear jump-off round and time of 37.747 seconds. Brianne Link and E Bay, last week’s winners, were a close second place in 37.819 seconds. Maria Costa and Reno were third with a time of 38.140 seconds. Karen Polle and Bottom Line were the fastest in the $20,000 High Junior/Amateur-Owner Jumper Classic presented by Miller Motorcars. They crossed the finish line almost a second faster (40.541 seconds) than Gabriela Mershad and Ledgepoint, who had a time of 41.435 seconds. Third place went to Charles Jacobs and Cassinja S, who were just fractions slower in 41.540 seconds. Grand Children’s Pony Hunter Champion: Ashworth, ridden by Mackenzie Wanicka for Ridgefield Equestrian Center, Inc.
WATCH LIVE! Video on demand of the $100,000 Empire State Grand Prix is available on the USEFNetwork.com presented by SmartPak. All classes in the Grand Prix Field and Sand Ring are also available at www.shownet.biz.